From the full-body massage, to concentrated neck and shoulder relief, to lounge and cool-down seats, you get the spa experience that's just right for you. Plus, most jets inside a Master Spa are adjustable from a full 100% power down to as little as 10%, so you can customize every seat in the spa. 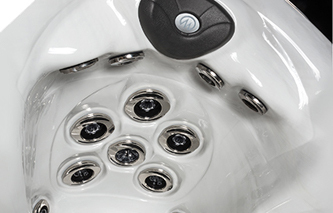 Our massaging jets aren't the only thing that will provide you with world class hydrotherapy. The heat from our hot tubs is used to soothe and quiet your body. If you have tense or sore muscles, whether from exercising or from stress and anxiety, heat is recommended as a remedy for that. 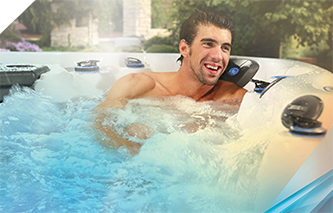 While being submerged in a Master Spas hot tub, your body, and more specifically your joints, are relieved of much of the effects of gravity. While water moves across your skin from our jets, it stimulates the touch receptors on your skin, which in turn increases blood circulation, ultimately releasing tight muscles. Our Master Blaster® Foot Therapy System uses dual jet clusters with 28 total individual nozzles designed to rejuvenate your body through an encompassing foot massage. This unique form of reflexology is bolstered by scientific studies into the health benefits of foot massage. Our Master Blaster® Foot Therapy System is powered by a separate oversized pump, generating 200 gallons per minute of powerful, yet soothing, foot relief. Our exclusive stress relief reverse molded neck and shoulder seat features a ledge with specially designed jets that are trained downward—putting your neck and shoulders under the jets for the ultimate tension-relieving massage. Feel the stress-relieving power of our massaging jets, and you'll wonder how you lived without it.